My main vegetable garden is basically divided into three sections-Section 1, Section 2 and Section 3-each section being around a 1000 square feet. So as I look at what I call ‘Section 3’, all I see is row cover everywhere! Looks like I laid out my laundry all over the ground but this is temporary. Row cover is used for extending the seasons and for protecting crops. When I plant new transplants such as eggplants and peppers, I find our winds horrible on them, whipping them around and drying them out-totally stressing the poor little things so I put these mini hoops over them and put row cover on that protecting them from the ferocious winds we’ve had. When I plant seeds, I also cover them with row cover to protect them from the birds and other animals eating the seedlings as the germinate. Birds love bean sprouts, corn sprouts and cucumber sprouts but when I cover them, the birds don’t know what’s going on underneath when they germinate. So the garden looks like hell for a couple of weeks but will save me time and frustration of replanting more seeds later. 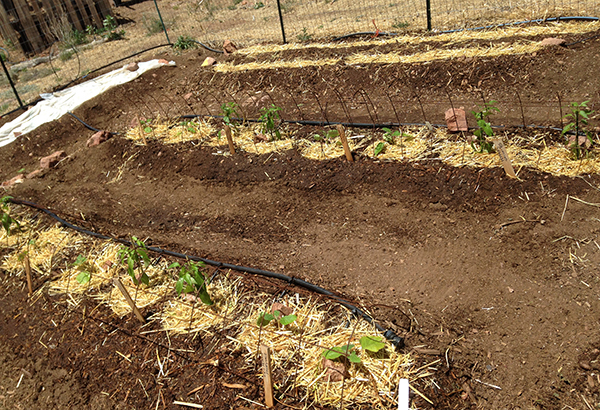 This year after I planted the corn, bean and cucumber seeds, I put straw around them to help keep the soil moist and since I waited to plant later, an added bonus is the soil is pre-warmed and the straw will help hold in the moisture when I water. 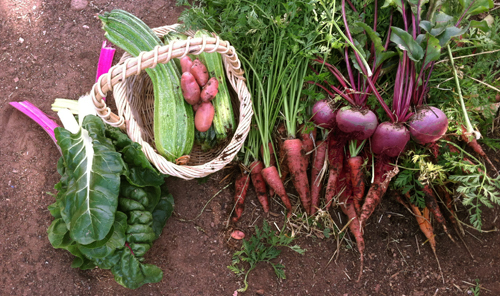 Cucumbers, corn and potatoes are in! Why do I feel so far behind?! Yesterday I finished putting in my seeds for cucumbers, potatoes (really late there) and a new corn called ‘glass gem’ yesterday. Then I remind myself it just hailed last week and snowed the week before so perhaps I’m more on schedule than I think this year. All the crops will get row cover over them to protect them from birds eating the seedlings. Out of sight, out of mind. Today I put in 8 pepper and 8 eggplant transplants and have 8 more of each to plant tomorrow plus squash seeds and Tarabais bean seeds to plant by the weekend. Sounds easy but after I lightly turn the soil in the bed, add amendments in each hole, put the plant in, make a well around each plant to hold the water around the plant, connect a drip line and wrap it around each plant, put straw around each well and make cages to protect them and lastly put row cover over the cages which I secured using rocks so they won’t blow off. Phew—it all takes time. I get tired just thinking about it! I am still germinating the gourds under the lights in the house which as soon as they come up and grow their first true leaves I will put out. Oh yea and the beets and carrots have to still go in. Sigh—so much to do! And did I mention I put in my one purple tomatillo plant? Blah. Blah. Blah.